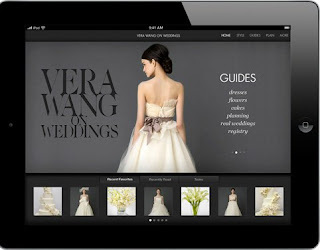 A Bedazzled [kind of] Life: Free Vera Wang App! Vera Wang has released a spiffy new iPhone and iPad app for the detail oriented bride. Interactive Inspiration Boards, allowing brides to pull and play with images from a cache of over 1,000 pre-populated shots, as well as add photos from the internet or their own camera roll. Photo Galleries in different categories, such as dresses, cakes, flowers and real weddings. Style Boards, featuring Vera's take on different styles of brides: Individualist, Modernist, Traditionalist, Romanticist and Minimalist. Sharing functionality allows a bride to email her favorite photos, inspiration boards, wedding to-do's and guests lists to her family, friends and vendors. but come March 1st it will cost $9.99.